Antenna is not actually a "long wire" unless it is one wavelength or greater in length. Yet many amateurs refer to (relatively) long physical spans of conductor as "long wires." For the purpose of this discussion we will assume we have a fairly long span of wire, and refer to it as an "end-fed" wire antenna. If we use small-diameter enameled wire for our end-fed antenna, chances are that it will be very difficult to see against the sky and neighborhood scenery. The smaller the wire, the more "invisible" the antenna will be. 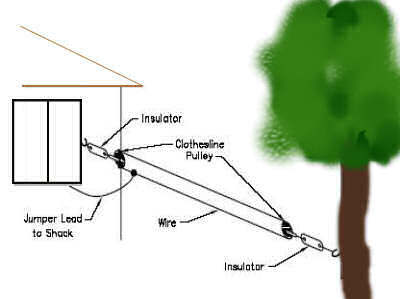 The limiting factor with small .The clothesline antenna is more than it wire is fragility. A good compromise is #24 or #26 appears to be. magnet wire for spans up to 130 feet; lighter-gauge wire can be used for shorter spans, such as 30 or 60 feet. The major threat to the longevity of fine wire is icing. Also, birds may fly into the wire and break it. Therefore, this style of antenna may require frequent service or replacement. Illustrates how we might install an invisible end-fed wire. It is important that the insulators also be lacking in prominence. Tiny Plexiglas blocks perform this function well. Smalldiameter clear plastic medical vials are suitable also. Some amateurs simply use rubber bands for The "invisible" end-fed antenna. end insulators, but they will deteriorate rapidly from sun and air pollutants. They are entirely adequate for short-term operation with an invisible antenna, however.